TOP QUALITY RYOBI COMBO TOOLS. WE ARE YOUR TOOL EXPERTS. 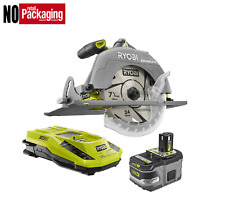 Ryobi One System Cordless Drill & Circular Saw Combo 18 V Includes Charger New in Box Condition: Very good condition. New in Box. Box has some dust and wear due to storage. Please see detailed photos below for item condition..., . Model # P1848 (P5085 P194 P117). Includes:P508 7-1/4 in. RYOBI introduces the 18-Volt ONE Lithium-Ion Cordless Brushless 7-1/4 in. The 7-1/4 in. blade provides a 26% increased cut capacity and blade variety. Search for Ryobi P1837 for full details. 3ah Lithium HP 18v battery. 2ah Lithium 18v battery. Still sealed in box. 3 Tool combo kit Circular Saw 7.25" blade. Impact Driver with up to 2000lbs of torque. Great Ryobi 18V tested and working set. Power Source Battery. Battery Included Yes. 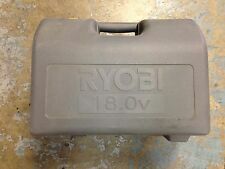 A used 2 piece Ryobi combo 18V tool kit with case. The one good battery reads and holds 20V and is a high performance battery. Great Ryobi 18V tested and working set. Model DC759 & DW938. These tools are used but tested and in great working condition! MPN Does Not Apply. Power Source Battery. Tools Included: Circular Saw,Drill,Impact Driver,Miter Saw,Reciprocating Saw,Worklight. This kit provides a variety of tools to get all of your projects done. 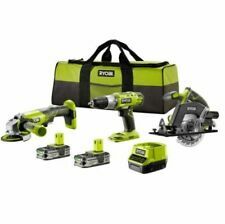 Backed by the RYOBI 3-Year Manufacturer's Warranty, this RYOBI 18-Volt combo kit includes a 7-1/4 in. Reciprocating Saw Model RJC 180. Light P700. This set was picked up from an estate and is being sold as is in condition it was found. I have not tested. Has Skilsaw. Sawzall and flashlight. They look to be in decent condition. Obvious wear from use. ONE+ 18-Volt Lithium-Ion Ultimate Combo Kit (6-Tool) Drill Driver Saws etc. 2 compact lithium 18v batteries. 18 V 6 piece ultimate combo includes Circular Saw. Reciprocating Saw. Compact drill/driver. 5 out of 5 stars - ONE+ 18-Volt Lithium-Ion Ultimate Combo Kit (6-Tool) Drill Driver Saws etc. 90 product ratings90 product ratings - ONE+ 18-Volt Lithium-Ion Ultimate Combo Kit (6-Tool) Drill Driver Saws etc. Drill includes a 1/2 in. heavy-duty single sleeve, keyless chuck with 24 position clutch to match your drilling and driving needs. Circular saw has a left-side blade for better cut line visibility. Reciprocating saw features blade clamp for quick and easy blade changes without tools. Ryobi 18-Volt ONE Lithium-Ion Cordless 10-Tool Combo Kit with (1) 4.0 Ah Battery, (1) 1.5 Ah Battery, 18-Volt Charger and Bag RYOBI introduces the 18-Volt ONE Lithium-Ion Cordless 10-Tool Combo Kit with (1) 4.0 Ah Battery, (1) 1.5 Ah Battery, 18-Volt Charger, and Bag. Equipping you with everything you need to get the job done, the 10-Tool 18-Volt ONE Combo Kit provides superior control and performance. It boasts a drill/driver, impact driver, reciprocating saw, circular saw with blade, jig saw, area light and more. The included compact Lithium battery means you will never run out of power. All of these tools work with all Ryobi 18-Volt ONE batteries, the same platform that supports over 100 great RYOBI tools. Ryobi 18V ONE ONE Cordless Brushless Dual Bevel Sliding Miter Saw (Tool Only) Operates in a smooth motionFeatures an easy-to-set design for added conveniencePrecision cut provides exceptional results 18-Volt ONE ONE Cordless Brushless 10 in. Dual Bevel Sliding Miter Saw (Tool-Only) Ryobi introduces the first tool in its ONE ONE lineup: the 18-Volt 10 in. Cordless Brushless Dual Bevel Sliding Miter Saw. The ONE ONE system uses 2 ONE 18-Volt batteries for 2X the power, for a full 36-Volts of Max Power. Not only is this saw powerful, it's extremely portable: carry it anywhere and cut what you need without the hassle of a cord or trying to find an electrical outlet. The brushless motor provides longer runtime and longer tool life, while the dual bevel design allows you to move the saw, not the. Seldom has a comprehensive cordless power tool kit been so affordable. This do-it-yourself Ryobi Super Combo is chock-full of ONE 18-Volt lithium-ion devices that will turn chores into hobbies. The variable-speed reciprocating saw in this bundle includes a blade with a 7/8 in. Ryobi introduces the first tool in its ONE ONE lineup: the 18-Volt 10 in. Cordless Brushless Dual Bevel Sliding Miter Saw. The ONE ONE system uses 2 ONE 18-Volt batteries for 2X the power, for a full 36-Volts of Max Power. It boasts a drill/driver, impact driver, reciprocating saw, circular saw with blade, jig saw, area light and more. All included tools work with any Ryobi 18-Volt ONE battery. Circular saw: 0-56 bevel cut capacity allows user the ability to cut the most common angles. Ryobi 18-Volt ONE introduces lithium-ion performance at Ni-Cd prices. The drill includes a 1/2 in. heavy-duty single sleeve, keyless chuck with 24 position clutch to match your drilling and driving needs. This 5-tool combo kit is full of tools to get the job done. The included 1.3 Ah batteries are engineered to run 20% longer than their NiCd high-capacity counterparts. Compatible with over 125 RYOBI 18-Volt ONE tools. It boasts a drill/driver, impact driver, reciprocating saw, circular saw with blade, jig saw, area light and more. All included tools work with any RYOBI 18-Volt ONE battery. Hybrid fan: Hybrid portable fan conveniently runs off RYOBI 18-Volt ONE battery or electric power with an extension cord. Equipped with everything you need to get the job done, the 5-Piece RYOBI 18-Volt ONE Combo Kit provides superior performance. The angle grinder is capable of 6,500 RPMs. You can rely on the impact driver for lag bolts and desk screws – or any high-torque fastening job. All brushless tools are compatible with RYOBI 18-Volt ONE LITHIUM HP batteries for maximum performance. Tools Included: Angle Grinder,Circular Saw,Drill,Impact Driver,Worklight. Includes: (1) P252 Brushless Drill/Driver with screwdriver bit, (1) P508 Brushless Circular Saw, (1) P239 Brushless Impact Driver and bit, (1) P423 Brushless 4-1/2 in. This do-it-yourself Ryobi Ultimate Combo Kit is chock-full of 18-Volt lithium-ion devices that will turn chores into hobbies. The variable-speed reciprocating saw includes a blade with a 7/8 in. stroke length capable of 100 SPM. Chuck that easily secures bits with the chuck jaws but also has a 1/4 in. collet so you can quickly attach a hex bit. of torque for the most demanding applications. The 7-1/4 in. Brushless Circular Saw that has a 0-56Â° bevel cut capacity so you can cut the most common and complex angles. Ryobi introduces the first tool in its ONE lineup: the 18-Volt 10 in. Cordless Brushless Dual Bevel Sliding Miter Saw. The ONE ONE system uses 2 ONE 18-Volt batteries for 2X the power, for a full 36-Volt of Max Power. Tools Included - Circular Saw,Drill,Reciprocating Saw,Worklight. This do-it-yourself RYOBI Super Combo is full of 18-Volt ONE lithium-ion tools that will turn chores into hobbies. The variable-speed reciprocating saw in this bundle includes a blade with a 7/8 in. Circular saw has ergonomically designed handle with over mold to increase user comfort. Circular saw has a left side blade that provides improved cut line visibility. Tools Included: Circular Saw,Drill.